A group of postgraduate students at the School of Natural Sciences in Dublin has come up with an innovative way of engaging with the Irish public about the importance of biodiversity. They’ve produced a set of eight “Biodiversity Beermats”, each featuring a fun biodiversity fact, and beautifully designed and illustrated by Aileen Crossley from Rathfarnham, Dublin. The beermats have been distributed around a selection of Dublin pubs. Established in 2011 as a working group of the Trinity Centre for Biodiversity Research, the group aims to improve links between the university and the Dublin public, and to find new ways of communicating the important biodiversity is to our everyday lives. The group has also been running a series of “pop-up” pub talks — 2-3 minute flash-talks providing fun facts about the bees, coral reefs, flamingos, and salmon featured on the beermats. There are a lot of fascinating facts that we wanted to share, but were unable to fit on the beermats – so this is your chance to find out more! 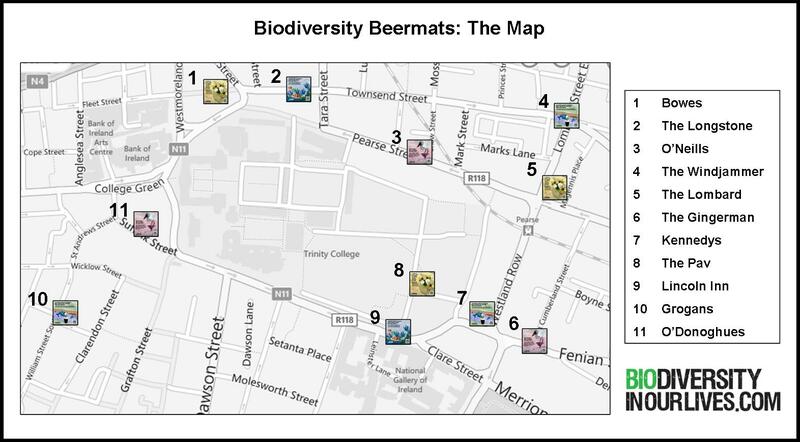 Look out for the beer mats in participating Dublin pubs, and check out the Biodiversity in Our Lives website for more information on the initiative.